The sash window is a period feature offering beautiful design, historic elegance and sophistication. Sashes can tell much about the background of a property, and must be considered for refurbishment and repair rather than replacement and destruction. With professional care and attention for sash windows London homes can take advantage of expert repairs, maintenance and refurbishment. Sash windows are truly special features for any property and every care should be taken to restore its appeal and uphold its architectural significance. These windows date as far back as the 17th century upon its initial inception in apartment blocks and commercial properties. For homes and large properties with sash windows, reliance on the wood repair and enhancement services provided by Mortice and Green can best manage value and appeal. The sash window delivers striking aesthetic qualities and is available in a range of sizes and styles owing to changes in modern day living and production. While these windows can be incorporated for the modern home in unique styles, the original windows that have remained untouched are best preserved by an expert window repair service. From its delicate features to its insulation, any problems with sashes should be addressed with the highest standards of expertise. Mortice and Green has established a profound reputation in the industry based on their experience and attention to detail when managing sash and wooden windows. Reliable service delivery and a quality standard of workmanship provide lasting results and supports the longevity of all types of wood frames. To ensure you are investing in your home or future property, maintain the beautiful condition of sash windows with a professional service. Every original sash window tells a unique story of the history and architecture of its building. There are two main styles of windows including Georgian and Victorian sashes. The Georgian sash window consists of 6 small panes while the Victorian range has fewer panes and larger sections of glass. Each f these hold significant cultural and historical value and should be managed by professionals in the window business. If you are taking on older properties and wish to have period windows installed, it is important to consult with specialist sash window installers such as Mortice and Green. The process is intricate and does not involve a quick job. Your window repair service must evaluate the historical significance of the property and determine which styles of sashes are most applicable to restore its value. The most common type of material used in the construction of sash windows is wood owing to its affordability and natural aesthetics. Modern versions of sashes include the use of uPVC but this takes away from the original appeal of these frames. The natural beauty of timber and solid wood included in the design of sashes must remain part of the history of these vintage frames and properties. Professional window repair services focus on retaining the original condition of historic sashes to ensure its historic meaning is maintained. Older properties with beautiful features can be enhanced with the right care services and the use of quality, lasting materials. Your trusted wood window experts, Mortice and Green, work with all types of sash and wood windows and provide exceptional recommendations for the enhancement of all styles of windows. A reputable window company can advise on effective replacements and procedures to restore the appeal of the home. For sash windows, highly specialized practices are provided including the choice of quality materials that will last against the impact of harsh weather conditions. Your trusted window repair service can provide routine maintenance to keep all styles of sashes in impeccable condition. If your sashes are not able to be restored, Mortice and Green offers authentic installation and replacement solutions to maintain the integrity of the feature. It is important to have the sash windows recreated to represent the original design and ensure that quality is delivered. Timber is a preferred choice of wood providing the durability and beauty associated with such frames. Sashes for older buildings incorporating wood in its construction must be handled by a highly professional and experienced window service. If you are experiencing problems in the condition of frames or simply wish to enhance its appearance, do not attempt to perform these activities on your own. Mortice and Green can deliver precision services and apply secure, safe practice to restore windows without liability. If you experienced constant drafts through the frame of your sashes, it is time to call on reliable repair services. Wood provides the best form of insulation, but when the frames are damaged, it allows the indoor heat to escape and cold to settle in making for uncomfortable living conditions. Sealing the wooden frames and restoring the sash without major construction, will create energy efficiency and minimize replacement costs. The beauty of sashes cannot be denied and this is among the many reasons, more modern homes are seeking its installation. The windows can include double glazing with the choice of panes to best complement the style and exterior of property. The design may have changed from its 17th century origins, however it maintains its charm and unique character that tell a true historical tale. 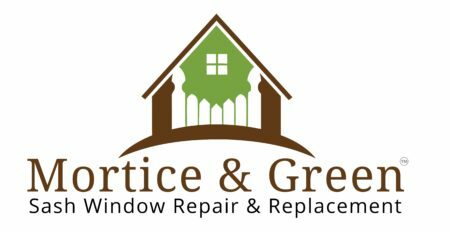 Mortice and Green remain your trusted window repair and restoration specialists. With extensive experience in the industry and exceptional skill to match, comprehensive services provide guaranteed workmanship standards and guarantees. Experts advice on the technicality of major restorative jobs to support the longevity and enhancement of windows. A sash window of historic significant provides detail, authenticity and aesthetics for any style of home. Whether a new property or older house requiring the refurbishment of wood detail, Mortice and Green remains your number one choice specialists and effective maintenance services. Solid wood materials are sealed and protected to support its longevity. Restore the beauty of your wood windows and own a piece of history by calling on Mortice and Green to restore sash window integrity. Sashes remain a significant part of early architectural design but remain significant in the modern residential and commercial property. The correct practices and procedures restores beautiful sash windows for lasting appeal.